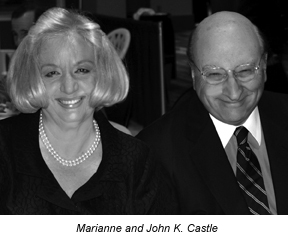 The School of Veterinary Medicine announced a gift of $1 million from philanthropists Marianne and John K. Castle to support its laminitis research. “We are enormously grateful for the Castles’ generosity. Their thoughtful philanthropy leverages two of the University’s strengths, research and the translation of research into medicine for both animals and humans,” said President Amy Gutmann. In addition to funding research in laminitis, the Castles’ gift will support the institute directorship, which will be held by Dr. James Orsini, associate professor of surgery at Penn Vet’s New Bolton Center campus. In 2001, Dr. Orsini founded the First International Conference on Laminitis and Diseases of the Foot, building on his many years of experience treating patients afflicted with this condition. The biennial conference is funded in large part by the Castles, in memory of their beloved horse, Spot, who died from laminitis. When fully funded, the institute will include new research laboratories, funding for research projects at Penn Vet, and in collaboration with other institutions, a home-care treatment model, support for student research opportunities, and improved clinical facilities. “The Castles’ generosity will allow us to take a significant step forward in creating a research institute dedicated to sharing and advancing the breadth of knowledge about this deadly condition,” said Dr. Joan C. Hendricks, the Gilbert S. Kahn Dean of Veterinary Medicine.